So, it’s February. Did the New Years resolutions last? Is the health kick still going strong? There’s a high probability most people will answer no. The problem with many goals made in January is that they’re too extreme: they’re an all-or-nothing approach to changing one’s health, diet or lifestyle, and this makes them difficult to sustain. If altering the way you eat was one of your 2018 goals and you’ve hit February with a total abandonment of the drastic changes, then perhaps small steps are the way forward. Eating the way you want and enjoy, whilst switching up a few foods each month to slightly better alternatives, is more likely to help you improve your health long-term. And what better way to start than with the fast-approaching Pancake Day! 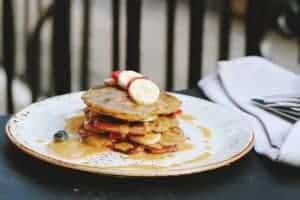 With this recipe, you can enjoy Shrove Tuesday indulgence the same way you always do, but with a few small tweaks to make the pancakes that little bit better – tweaks that you can maintain all year long. This is a regular pancake recipe with flour, eggs and milk. There’s no extra effort required in finding obscure ingredients or needing to use more difficult techniques, but there are tiny differences. Firstly, use spelt flour instead of plain flour. Organic, white spelt flour is available at nearly all major supermarkets. I’ve found it’s completely interchangeable with regular flour in every recipe I’ve ever tried because it still contains gluten; however, the plus point in its favour is that it’s not made from wheat, which in this modern age, is pure sh*t (but that’s another post!) The eggs are organic. I’m a huge eggs fan (egg yolks, more specifically) and believe them to be a total superfood but getting organic over just free-range alone means a superior, more nutritious product. If there’s one easy health change you can make for life, it’s to make sure your eggs are always organic. Finally, there’s the milk: you choose whatever the heck you want to use! If you’re ok with dairy, use organic whole milk. The more skimmed you go with dairy, the higher the amount of sugars and this is worse for you than some natural fats from whole milk. You can also use coconut milk or any of the nut milks found in supermarkets these days. While I personally prefer to make my own nut milks, go with what’s easiest for you. Don’t forget to tag Vitamin Buddy and myself to show us your pancake creations. Happy flipping! Spoon the flour into a bowl through a sieve. Beat the egg in a separate bowl and pour into the flour along with the pinch of salt. Using an electric whisk (or a regular balloon whisk if you don’t mind some elbow grease) beat the flour and egg whilst slowly adding in the milk until you have a completely smooth batter. Leave to rest for twenty minutes if you can, otherwise get straight to cooking! Put a pan over a medium heat until hot and then add a small amount of your cooking fat of choice (I like unsalted butter or coconut oil.) The pan should be hot enough to cause a little sizzle but not smoke. Add a dollop of pancake batter in the pan, and move the pan around to spread the batter to the size and thickness desired. Cook for 1-2 mins and then flip into the other side and cook for another 1-2 mins. Repeat with all the other pancakes, adding a fresh little knob of butter/coconut oil etc for each new one. Top with your favourite ingredients and devour! Like the granular texture of sugar in the classic sugar and lemon combo? Use coconut sugar. Use raw honey/coconut nectar/pure maple syrup for a sticky topping. If you love hazelnut chocolate (who doesn’t?) opt for vegan chocolate hazelnut spread instead of the popular toxic, commercial brand. The Meridian organic brand do a cocoa-hazelnut jar but I actually prefer to use their crunchy, plain hazelnut butter mixed with some 90% dark chocolate. I also love melted chocolate with some clementine pieces for a delicious chocolate-orange combination. Peanut butter and banana: enough said! Stuff with any savoury ingredients if you don’t have a sweet tooth.